Themes: Hi-Lo, graphic novel, adapted classic, low level classic. This series features classic Shakespeare retold with graphic color illustrations. Educators using the Dale-Chall vocabulary system adapted each title. Each 64-page, softcover book retains key phrases and quotations from the original play. Research shows that the more students read, the better their vocabulary, their ability to read, and their knowledge of the world. 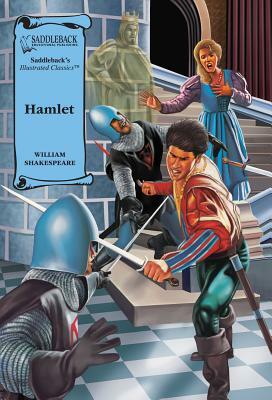 Hamlet takes place in the early seventeenth century, at he royal castle in Elsinore, Denmark. The theme of the story.. "revenge" ..becomes Prince Hamlet's obsession. His split personality--one of warm, poetic sensitivity, the other, cruel madness--hypnotizes the reader. Other immortal characters such as Claudius, Gertrude, Polonius, Horatio, and Ophelia are just a few in the tradition of Shakespeare's unforgettable characterization.